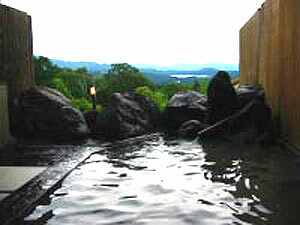 Description: This hot spring is located in the Shin-Akakura area between Akakura and Ikenotaira in the Akakan Ski Area. It was opened in 1929 by separating it from the Akakura Hot Spring which has its source in Mt. Myoko's northern Jigokudani Valley and Maeyama, a nearby mountain. Description: The source spring is located halfway up Mt. Myoko. This area has many hot springs, but Myoko Onsen is the only place where you can enjoy a full view of the beautiful mountain. This hot spring provides a soft, gentle stimulation to the skin—perfect for those who like a long, lingering soak. Discount Shinkansen Tours: Great deals for visitors to Japan - up to 58% off! Effective against chronic skin diseases, sensitivity to cold, nervous disorders, rheumatism, fatigue, chronic women’s diseases and neuralgia. 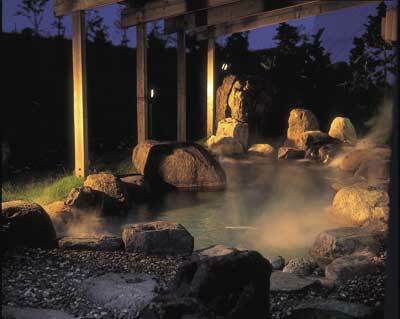 There are two public onsen in the area which is found on a plateau approximately 760 meters above sea level. 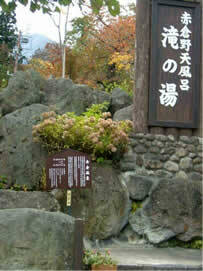 Ike-no-Taira Onsen is located on of Mt. Myoko near Imori Ike (literally, "Salamander Pond") which has long been a symbol of Ikenotaira. The area is dotted with birch trees and has an almost European atmosphere. The 72-degree hot spring water, drawn from the Minamijigokudani Valley, has a sulfurous scent and creates unique black mineral deposits in the shape of flowers. Perfect for relaxing and recuperating from a days skiing or walking. Set on a spectacular cliff-side setting, Tsubame Onsen has long been a destination for those desiring the road less traveled. The spring boasts white yubana (flower shaped crystals) in its mineral rich waters. The atmosphere here is somewhat nostalgic - reflecting a Japan of the post-war era. Some Tsubame Onsen hotels and facilities close here in the wintertime due to the famous heavy snows but others offer a unique wintertime experience - some only with access by snow cat. Ougon no Yu (pictured above), which has pools separated by bamboo mats, is one of the two free onsen that can be reached by hiking out on one of the trails leading up to Mt. Myoko from the top of the village area. Take the path to the left for about 3 minutes up a steep hill (the old ski area). 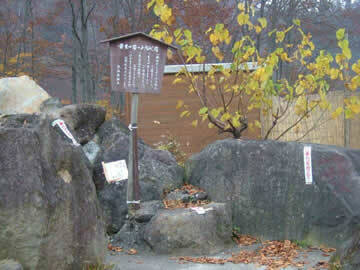 The other, Kawara no Yu, is a konyoku rotemburo onsen (mixed gender outdoor bath). For this one you have to take the right track for about ten minutes, cross over a suspension bridge, then take the small river path to the left for about 5 minutes. Pack your own towels (and modesty). Description This onsen’s spring source contains low levels of edible salt. Description Unohama Onsen is a small hot springs town with many inns. Enjoy a superb view of distant Sado Island as the sun sinks into the sea on the horizon. 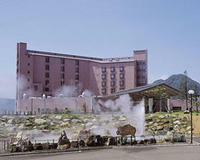 Renge Spa is series of hot springs located high up in the mountains bordering Niigata and Nagano. There is one inside onsen plus a series of mixed outside onsen that require a hike of 5-10 minutes each. There is a basic hotel available to stay in for 9,000 yen p.p. including two meals. Onsen admission for adults - 800 yen and children - 400 yen. Please note the onsen is only open from late-spring to mid-autumn. Exactly what is an onsen?